On the heels of the decision to shut down 50 Chicago public schools came a massive round of layoffs on Friday of 2,113 school staff, including about 1,000 union teachers. Combined with the 850 staff and 545 teacher layoffs in June, the new round of pink slips brings the summer’s total to almost 3,000 staff, including more than 1,500 teachers. Chicago Mayor Rahm Emanuel and Board of Education officials describe the drastic reshaping of the public schools system as a way to guarantee that students in the poorest and most underserved neighborhoods get a top-notch education with the best teachers. But critics question this rationale, given that many highly rated, award-winning and popular teachers and staff have been laid off. One example is Xian Barrett, a history and law teacher at Gage Park High School on the city’s South Side, who received a layoff notice on Friday. In 2009 Barrett was chosen as a Classroom Teaching Ambassador Fellow by the U.S. Department of Education. As the education department’s website notes, Barrett founded a citywide youth-led social justice organization called Chicago Youth Initiating Change, brought students to New Orleans for service learning trips and organized sister-city events with Japanese schools. The website describes his teaching philosophy: “Before the students lose interest in your instruction, ask them what they are passionate about and work with that—their learning belongs to them." Chicago Mayor Rahm Emanuel has blamed the layoffs in large part on the teachers’ pension liabilities, which reached $600 million this year. But many view the layoffs as an attack on theChicago Teachers Union, which has clashed bitterly with Emanuel and school officials, most notably in an eight-day strike last September that gained nationwide attention. Barrett is among those who see the layoffs and school closings as part of a larger plan to reduce the size and power of the teachers union and to replace regular public schools with non-union charter schools. 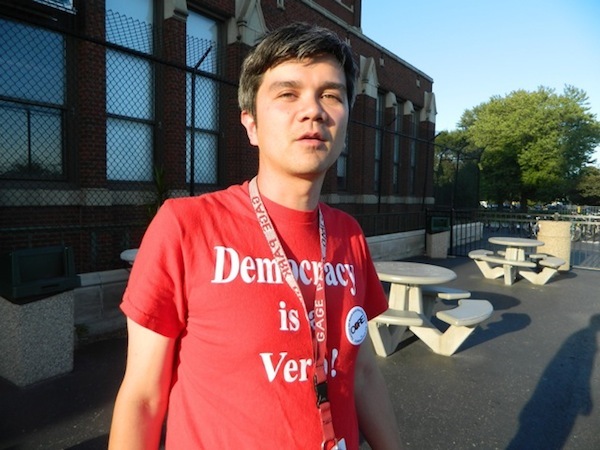 He was an early member of the Caucus of Rank and File Educators (CORE), the group that won leadership of the Chicago Teachers Union in 2010 union elections and became a thorn in Emanuel’s side after he took office in May 2011. But even more, Barrett sees the administration’s moves as an attack on the students who have demanded their voices be heard in the debate over the future of education in Chicago. There’s no evidence that specific teachers were targeted for the mass layoffs, but as the relationships between union teachers and administrators have become increasingly contentious over the past few years, union teachers have feared that their positions will be eliminated or they will not be rehired if they are seen as activists or troublemakers. Barrett also created lessons around direct civic involvement in the school: Students talked frequently about “students’ rights,” surveyed their classmates about changes they’d like to see and successfully lobbied for a more transparent detention policy. And Barrett has taken students on field trips to Board of Education meetings, where they have experienced firsthand the bitter Chicago debate over school closings and standardized testing. Barrett said that after these field trips some students have continued independently to attend board meetings and rallies. He thinks that’s a major reason he was fired from a former post at Percy L. Julian High School on the South Side in 2010. He was told his position was eliminated through “redefinition.” Barrett suspects, though has no evidence, that his advocacy with students could have been a factor in his layoff last week. After losing his job at Julian, Barrett worked for the union as political director, lobbying in the state capitol at the time the legislation, known as SB7, was being pushed that would lay the groundwork for Emanuel’s battle with the teachers union. Barrett took the job at Gage Park High School in 2011. Oddly enough, Barrett found out he had lost his Gage Park position from his mother—for some reason schools officials called Barrett’s emergency number to deliver the pink slip script. His mother was deeply familiar with the context for the layoff. She was a National Education Association organizing director in Urbana-Champaign, Illinois; and his father is a labor historian. Going forward, Barrett plans to stay in education, but work from a foundation or in organizing, rather than in the classroom—at least for the near future. Talking with In These Times three days after losing his job, (in one of several interviews he's given the magazine over the years,) he sounds uncharacteristically tired and dejected. He predicts growing popular opposition to the city’s plans for the schools, but worries about how this will translate to impact. “I think if I had taught differently, I’d still have a job,” Barrett continued. “But I don’t have any regrets about how I taught the students. We have to remember why we're here and what we believe in." The Chicago Teachers Union is calling on people to protest outside and attend the Board of Education meeting on Wednesday July 24 at 8:30 a.m., at 125 S. Clark St., downtown Chicago. Students opposed to the school closings have also called for a “Twitter storm” around the issue from 7 to 9 p.m. on Tuesday, July 23, with the hashtag #StopCPSCuts. First published at the In These Times Working Blog.